Here is Part One, in which we examine the astrology of the semi-secret 2007 ruling by the California government to deliberately reduce the water supply. This ruling has been brushed under the table by nearly all news media. Last Wednesday, governor Jerry Brown issued the state's first-ever mandatory water restrictions. As with most government rationing measures, certain favored groups are exempted. My current understanding is that nut farmers, the Nestle Corporation, fracking companies, and some environmental lobbies are so favored -- these groups will be allowed to expend water without the restrictions that the State will impose on presumed-inferior (non-State-favored) peoples. This is sketchy enough: on top of these inconvenient facts, folks like Alex Jones have been discussing evidence that state-sanctioned weather-modification technologies also play a significant part of the story. In any event, state-controlled apportionment rather than free-market pricing will encourage water wastage by state-anointed elites and remove the incentive by entrepreneurs and other jurisdictions to sell water to California. 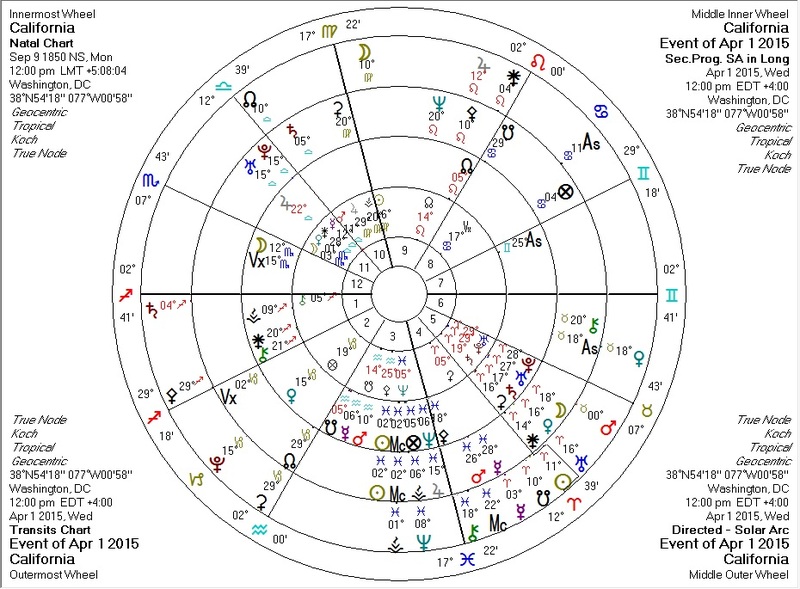 Here's a quick look at the astrology against the California chart for the day of the ruling. Transiting Pluto conjunct, transiting Uranus square progressed Venus in the Second House: a drastic shock to resources. Transiting Pluto novile California Pallas and sextile progressed Pallas: ethical crisis, in which ethics often lose. Transiting Chiron conjunct California IC: injury involving the land. Transiting Saturn conjunct California Ascendant and Chiron: authority and austerity exacerbating injury, in one's face. Transiting Pallas on California Second House cusp, trine California Pluto: the ethics of resource management, dictated by power? Transiting Neptune return in Pisces: water issues, long-term. But going away? Solar arc Moon conjunct California Saturn, exact within one year: at least another year of severe drought? Solar arc Jupiter two years from California IC in Pisces: will we see abundance in water then?